Margaret Thatcher Projects has, since its inception in 1998, been located in the West Chelsea arts district. 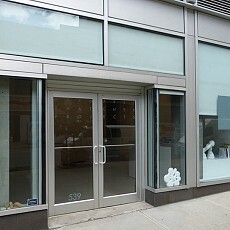 The gallery opened in its first space on West 20th Street. In 2002 Thatcher Projects moved to its artist-designed space on West 25th Street, the Whitehall building. In 2009 we relocated to our current home, a ground floor gallery at 539 West 23rd Street. Thatcher Projects presents a mix of internationally established artists alongside promising young talent. The gallery focuses on abstract painting and process. Over our almost 20 year history, the exhibition program has broadened to encompass both abstract and figurative idioms, all united by a pivotal attention to concept. Owner/director Margaret Thatcher brings a long history of integrity and professionalism to the development of the gallery exhibition program, and to the positioning of the gallery in the art community. Throughout most of the 1980’s she served as Administrator of Dia Art Foundation, working with Dia-supported artists and the founding Board of Directors to develop the institution’s public programs, including: The Lightning Field (Walter De Maria), Chamberlain Gardens (John Chamberlain), the Dan Flavin installation at Bridgehampton, and various other projects. In the 1990’s, until opening the gallery in 1998, Ms. Thatcher curated pop-up exhibitions in private and public spaces, and acted as advisor to art collectors building new contemporary collections. The gallery does not accept unsolicited submissions. Please be aware that we will not return mailed materials.